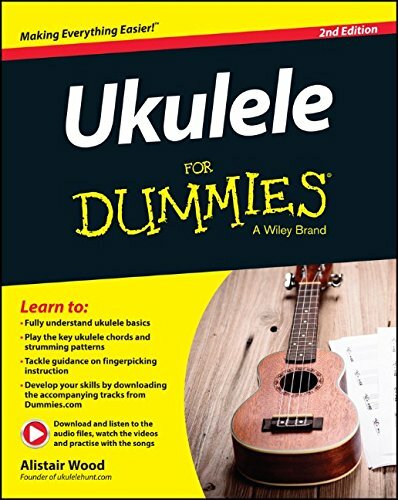 I’ve been blown away by how well Ukulele for Dummies has done. It’s sold over 100,000 copies now which is way beyond what I ever imagined. It’s also had good review. There are 151 5 star reviews on Amazon UK (with an average of 4.4 stars) and 185 5-star reviews on Amazon US (4.2 average). I can’t thank you enough for buying, reviewing and most of all recommending it. I know a lot of people who read Uke Hunt are the go-to ukulele person amongst their friends so I’m so massively grateful for people spreading the word. The publisher must be happy with how it’s gone as well. They asked me to do a second edition of the book which came out at the end of last year. Here are some of the details on it. – Ukuleleing the Holidays: Like the rest of the chapters in Part IV, it applies techniques from earlier in the book to a type of music. In this case, Christmas and New Year tunes. – Ten Greatest Ukulele Chords: My favourite chords, how to play them and when to use them. There’s a new section on useful mobile apps for ukulele players. There’s no CD anymore. But, mercifully, the downloads have been made easier to find and deal with. You can get them all here. Some (hopefully all) of the typos have been fixed, a few bits have been updated and I’ve clarified and changed a few things thanks to the feedback I’ve had. All the audio and video are easy to get now whether you’ve bought the book or are just curious. You can download the audio and watch the videos here. You can also find all the individual files linked here (useful if you’re on mobile). Should I Buy the First or Second Edition? I’d recommend the second edition. As well as the extra chapters I think some of the explanations are clearer. The only people I’d recommend the first edition to are those who are happier using a CD rather than downloads or have limited connectivity. But for people who would just rip the CD anyway, go with the second edition. I Have the First, Should I Get the Second? No, I wouldn’t recommend it. The new stuff isn’t essential in the 2nd Edition that wasn’t in the first.